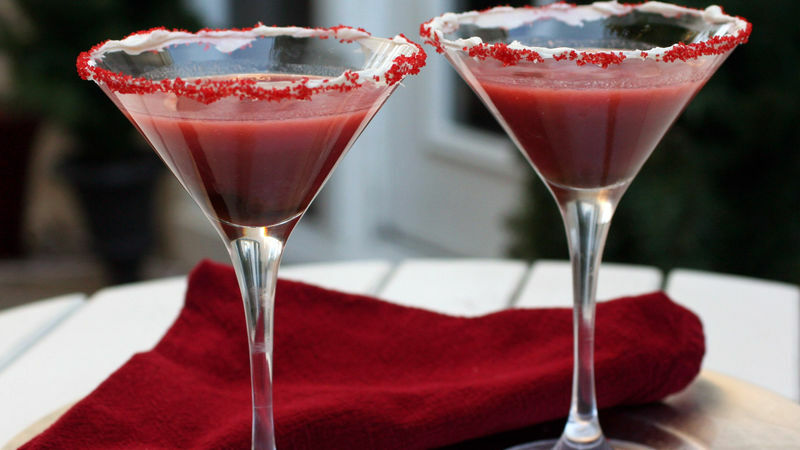 Dip rims of 2 martini glasses in frosting, then dip in red sugar. Drizzle 1 teaspoon chocolate syrup in bottom of each glass. Refrigerate. Fill cocktail shaker halfway with ice. Add vodka, crème de cacao, buttermilk and food color. Cover; shake vigorously until well mixed. Strain mixture into chilled glasses. You can use grenadine to color the drink, but it won’t turn as red as if you use food color.